The biological approach is also known as the biomedical model. The basic premise is that psychological abnormality has a physical cause such as illness or disease. Behaviour is shaped by internal, physiological factors. Abnormal behaviours are ‘illnesses’ caused by the possible combination of genetic, biochemical, hormonal and/or neurological factors. It has been demonstrated that first-degree relative of a person suffering schizophrenia have a 10% chance of developing the disorder. This is much greater than the 1% in the normal population. Family and twin studies have been carried out to assess the importance of genetics in abnormality. the findings however are difficult to interpret as members of a similar family may also share the same environment, therefore it may not be entirely due to biology. Infection has been found to be related to abnormal behaviour and may explain why people develop abnormalities. The flu virus has been linked to schizophrenia. Secondly Syphilis is a sexually transmitted disease that has been known to cause brain damage and therefore can be shown to lead to abnormality. Neurotransmitters are thought to be imbalanced in the nervous system of people suffering from psychological disorders. Excessive amounts of dopamine have been associated with schizophrenia. What illness has been associated with low levels of serotonin? Which hormone is associated with depression? Abnormal behaviour can occur if the structure of the brain is damaged in some way. An example is that of enlarged ventricles. Ventricles are sacks of fluid in our brain, people with schizophrenia tend to have larger ventricles than the normal population. Another example is Alzheimer’s disease, a type of dementia caused by the loss of cells in the nervous system. 1. One problem with the biological Approach is that the premise lays no blame with the individual. The biological approach suggests that there is a physical cause for abnormality therefore if we diagnose someone as having a mental 'illness' then it is true to say that the individual should receive treatment and support for their illness, but this is not always the case as some people believe that the individual is to blame for their abnormal behaviour (cognitivists). 2. A second criticism to the biological approach is that it relinquishes responsibility from the suffer. When using a medical model the individual is encouraged to be passive in their treatment. This will only treat the symptoms of the abnormality not the psychological cause. 3. A final weakness is that the biological approach is reductionist. The biological approach tends to break down explanations to the most basic simple level. The biological approach states that psychological abnormality has a physical cause this explanation does not consider the cognitions, learned behaviour or early psychosexual experiences. McGuffin et al (1996) investigated the genetic component of depression. They found a concordance rate of 46% in MZ twins and a 20% concordance rate in DZ (fraternal) twins. The behaviourist approach focuses on the ‘behaviour’ of a person in order to explain psychological problems. They claim that abnormal behaviour is learned through experience, and even if something has a physical or biological predisposition, the behaviour is maintained by environmental reinforcement. All behaviour is learned through stimulus-response associations. Watson and Rayner (1920) proposed that children learn phobias through paired associations. It is suggested that through classical conditioning people can learn to associate an unconditioned response with a neutral stimulus. Therefore resulting in a conditioned response that can lead to a phobia. Fear of heights = If a person climbs to the top of a high building (stimulus), looks down and feels nausea and dizziness (response), the association between the two, and the response will cause the phobia. Skinner (1974) explains that behaviour is influenced by the consequences of our actions in terms of positive and negative reinforcement. Positive reinforcement = childhood aggression is reinforced then the behaviour is likely to be repeated and may explain how a child learns that aggressive behaviours are appropriate. Also, anxiety or depression might receive reward in the form of attention and concern, also making the behaviour be repeated. This positive reinforcement means that the person will repeat that behaviour in the future as they want the positive attention. Negative reinforcement = maintains a learnt avoidance of a phobia as removal (moving away from the phobia) of the negative emotions and feelings will reinforce the behaviour. Therefore allowing the individual to learn that avoiding situations will reduce the negative emotions. Another example is when people suffer with addictions the removal of the withdrawal symptoms by the drug negatively reinforces the abnormal behaviour. Bandura suggests that if we observe behaviour, are able to recall the details, have the ability to replicate it and the opportunity to, then if we are motivated by reinforcements… we will imitate and repeat it. Children learn from role models within their lives eg. parents, older siblings and teachers.Antisocial behaviour can be explained by Social Learning Theory, if a child observes an aggressive model who is rewarded. This can lead to imitation therefore the child is likely to imitate antisocial behaviours like aggression. Also some phobias develop due to observing how a model responds to a stimulus. If a child observes a model respond in a negative/maladaptive way to a stimulus then it is likely that the child will also imitate that behaviour as they learn to be frightened of that object. Ellis (1962) and Beck (1963) : criticised the behaviourist explanation of abnormality because it focuses on stimulus -> response, but doesn’t take into account the mental processes in between. Cognitive Approach argues that it is the THINKING PROCESSES that occur between a stimulus and response that are responsible for the feelings that form part of the response. The Cognitive Approach suggests that psychological abnormality is caused by faulty cognitions, maladaptive thoughts and behaviours. Ellis identified that to every event in our lives we hold a belief and that belief leads to a consequence. It was further identified that distorted beliefs can lead to maladaptive behaviour and in turn psychological abnormality. 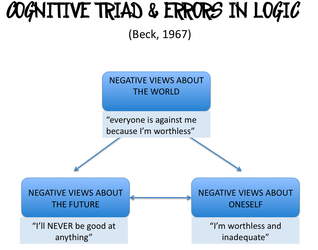 Along with EXPLAINING the Irrational Thinking (a-b-c model) from Ellis, you SHOULD also EXPLAIN the Cognitive Triad and Illogical Thinking theory from Beck (1967). Beck suggested that negative thoughts underlie mental disorders, but wanted to know why people get depressed? 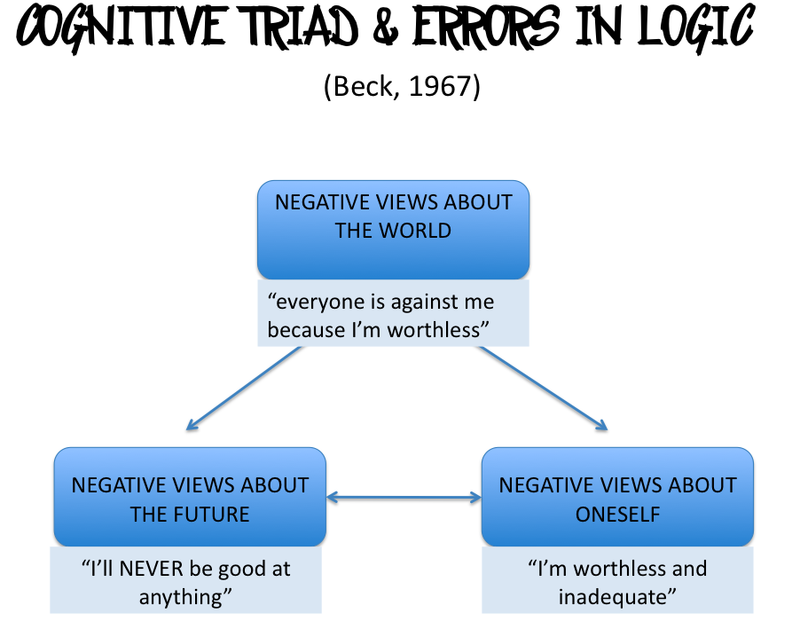 He proposed 2 mechanisms: errors in logic (depressed people form illogical conclusions when they evaluate themselves) and the cognitive triad.